This type of labelling is used in a variety of applications where a premium product is to be labelled or where short runs are the norm. 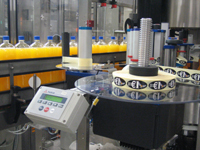 It is also increasingly used for applications where increases in line efficiency are required. 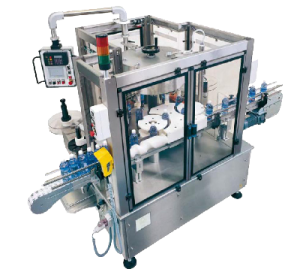 Enterprise Tondelli can supply from in-line self adhesive labeller to rotary multi station machines with typical labelling speeds from 500 bottles per hour to 35,000 bottles per hour depending on label length. One benefit of using self adhesive labels is that the machines run a lot cleaner with very little cleaning required. Single label application on a 19 litre container. Combination labeller with two cold glue stations and a self adhesive station with indirect application and automatic reel change over to eliminate machine stoppages. A combination machine for breweries to allow 3 labels body, back and neck or a wraparound body label to give maximum flexibility is also manufacture. Label application can be either direct or indirect depending on the container shape and also the speed. A benefit of indirect application is that the label positioning accuracy is dependant on the condition of the bottle where slippage can occur. With direct application the label is positively placed on the bottle by a vacuum drum and negates the necessary usual adjustment of labelling “beaks” which can prove challenging. Machines are manufactured in stainless steel with touch screen operation and setup. Change over is achieved with easy to follow calibrated handwheels with counters or indicators to ensure rapid and repeatable change over from one product to another. Handle orientation either on a carousel or infeed starwheel depending on the speed. Special photocell for transparent labels. Please enjoy reading our case study on King Henry VI spring water from Bolton Hall Limited, Lancashire, here…..
We also supply combination labellers with for instance self adhesive tamper evident with cold glue body labelling.